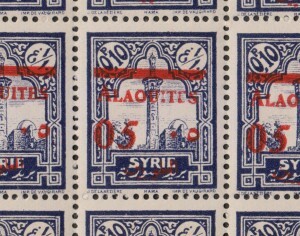 LAP | ALAOUITES: the overprint of 05 for revalue the stamp of 10 centimes. 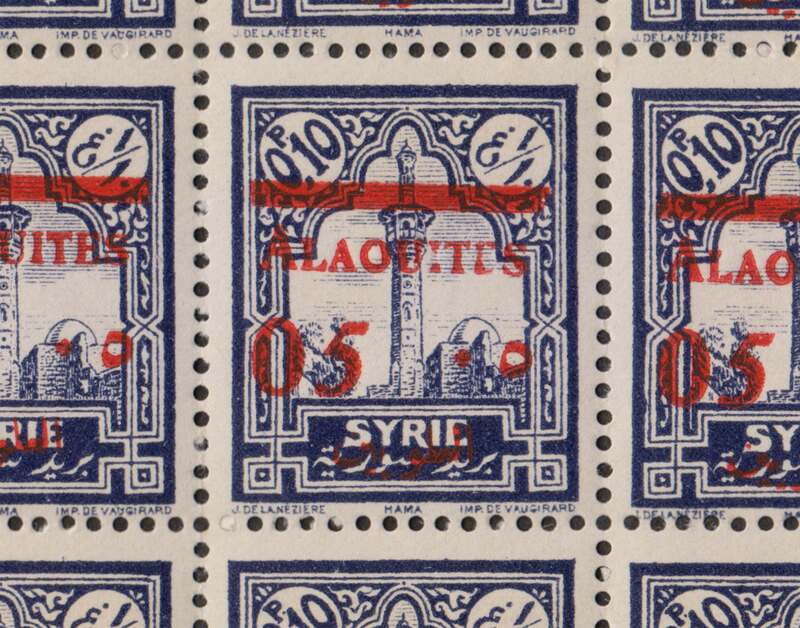 Alexander Kaczmarczyk, in his remarkable work “The Postal Issues of Syria, Lebanon and the Alaouites 1919-1945“, recorded the 05 centimes overprinted on 10ct stamp (fig 0) made on 2 November 1928, printing in 400’000 copies in sheet of fifty. 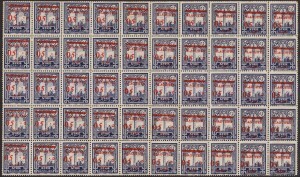 It also lists two shades of overprint in Red and Carmines and only two glaring errors: double overprint and overprint front-back. 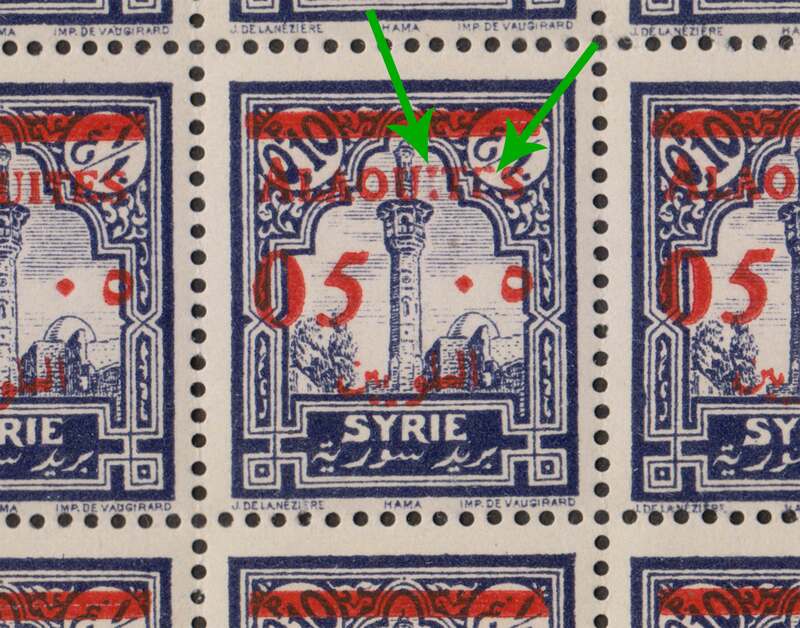 A happy coincidence made me discover at the Sunday market of Beirut (سوق الأحد), several full sheets of this small value overprinted. 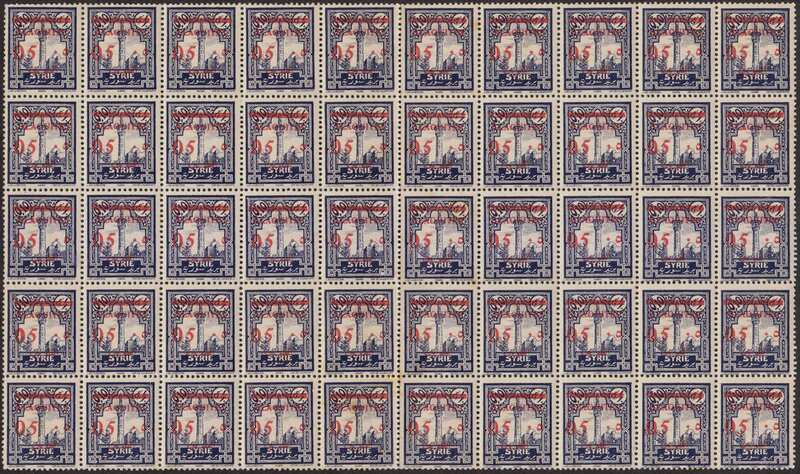 Immediately you could observe the presence of the two different color shades used for overprinting: Red and Carmine. 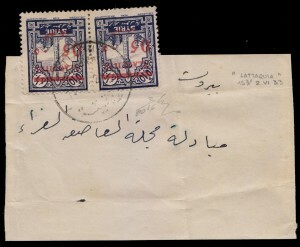 With a more detailed examination it was noted that the sheets with Red overprint, constantly had an error in the position 28 (the eighth stamp of the center strip): “I” and “E” broken in so as to be “ALAOU:TƩS” (fig 1 and 1a). 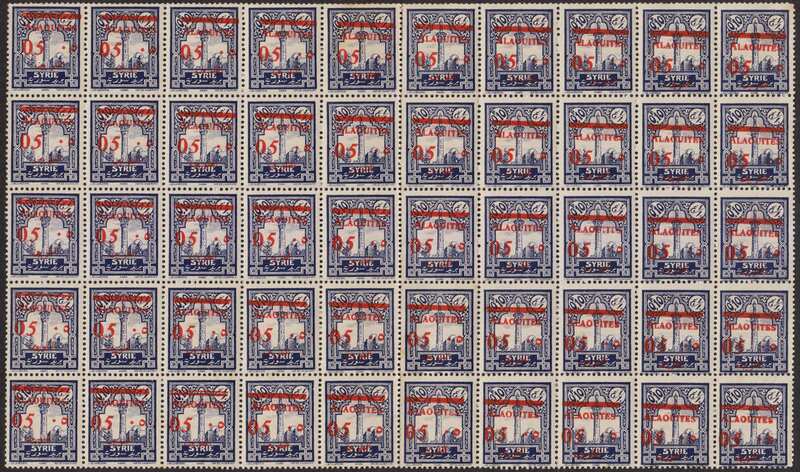 Also from the discovered sheets, he takes out one with sloping red overprint, not much, but sufficiently to be able appreciate the slope and, especially, to put well in light the error overprint in position 28 (fig 2 and 2a). 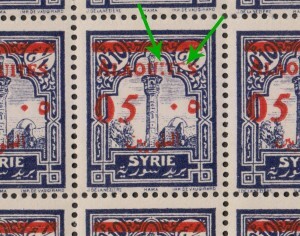 The stamps with overprint “Alaouites”, were issued the first time in 1925 on French and Syrian stamps and it not be necessary to issue a value of 5 centimes. 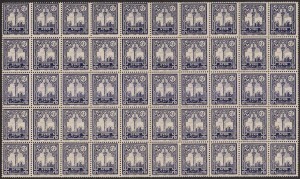 Only in 1928 came the need to use this small value for domestic rates of newspapers not exceeding weight of 50 grams and covers with advertising papers shipped in more than 200 specimens. 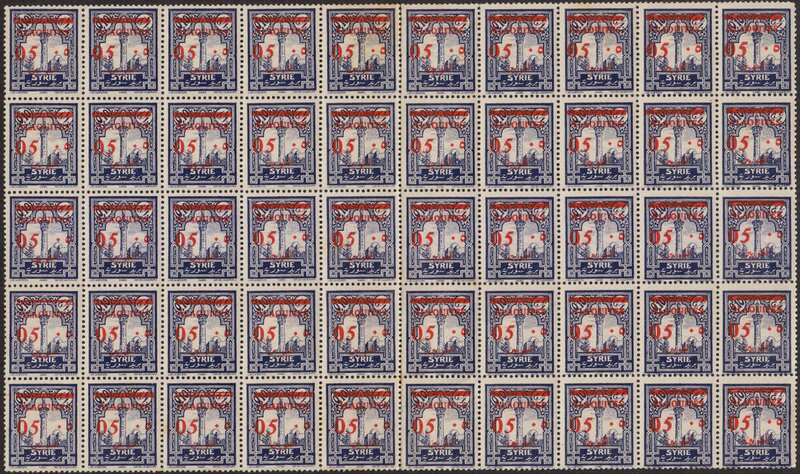 The first printing issued was with overprint in Red but had to be small in numbers and therefore it was necessary to resort a new overprint of 5ct on 10ct stamp but by a new typographical cliché. 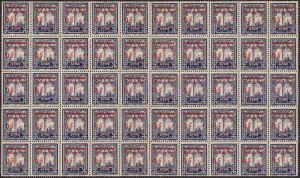 It has different characteristics from the previous one, but the showiest was for the Carmine color. 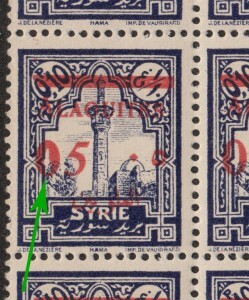 It is much more accurate and no longer appears the error at position 28, but this new plate appears recognizable even for a recurrent flashy flaw in the “0” of 05 at position 31 (Figure 3 and 3a). 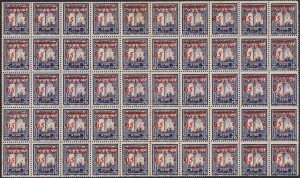 The reduction of rates from 10ct to 5ct was short, in fact I have never seen wrappers franked for 5 centimes, while the few I saw were all franked for 10 centimes (fig 4 and 5). 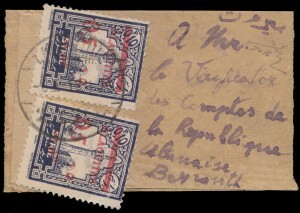 This is also confirmed by the fact that the new series of stamps issued in 1930 did not present a value of 5 centimes. 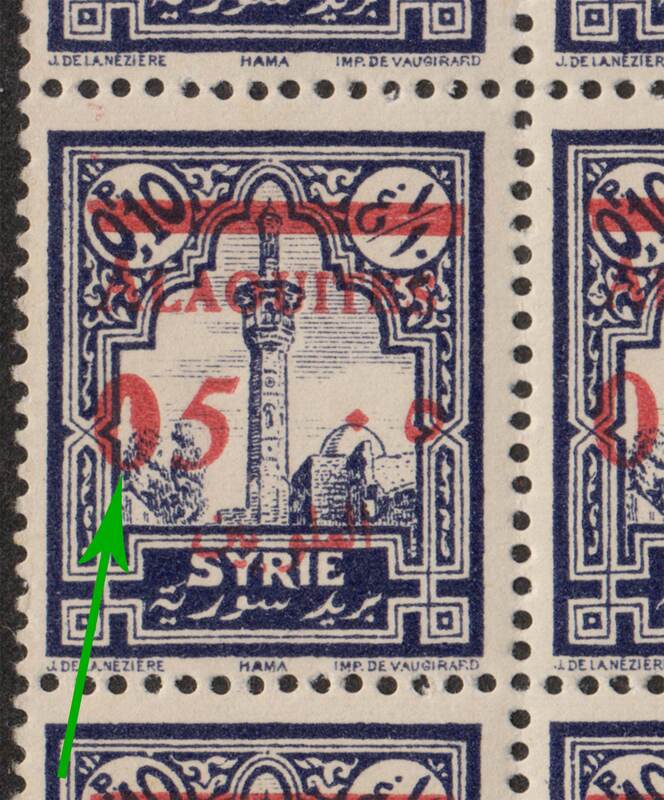 This happened also in the other Levant’s States under French mandate, but this will be the subject of another future article about this two very small rates. 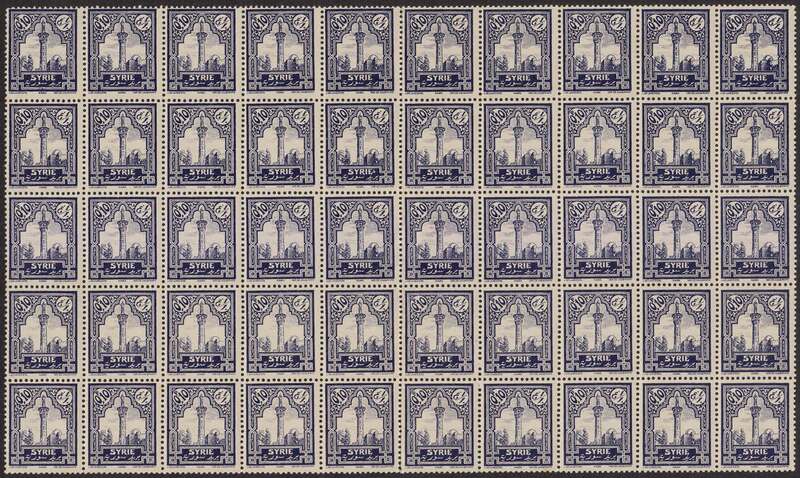 Be patient, please .